Marvelous picture – it is so full of wonderful details! Such a wonderful capture Marianne. As if the ceiling goes on forever! What time does the morning service finish marianne. We love malaga city. I’m not sure, Irving – I think last time I went inside (when I took this shot) I arrived around 2pm. Sounds good we are planning a day out in malaga. The hardest thing is finding a parking place. Maybe an idea to park in rincon and get the bus in. Any thoughts. What a Wonderful shot Marianne. Thanks Sreejith – much appreciated. 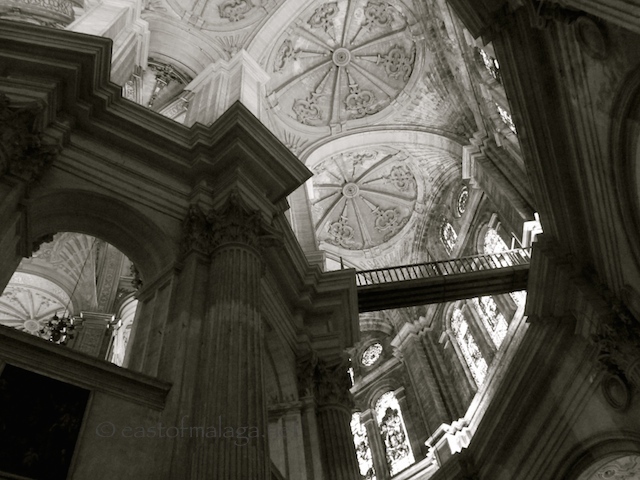 There’s magic in a vaulted ceiling, and your black and white highlights just how much. Wonderful capture, Marianne. I think I would like to walk across that bridge …. what do you think?